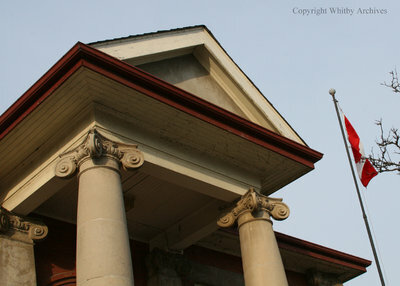 A colour digital photograph of the large columns and triangular centre gable on the front of the Flaherty Dow Elliott & McCarthy Litigation Counsel Office in Whitby, Ontario. Carnegie Library, January 2014, Megan Pugh. Whitby Archives D2014_001_003.